….with the Eukanuba/AKC National Championships in Florida. What a great idea to have a cluster of shows somewhere sunny as December takes a grip. No wonder there was a nice Glen of Imaal Terrier entry. The results were very, very similar with Killkenny Over The Universe to Setanta and Finnabair Double D Friend of a Friend making clean sweeps of the top awards (Over The Universe with BOB, Friend of A Friend Best Opposite) with the Selects slightly different. The same results held at the final show-The AKC National Championships with Keadean’s Sir Emmet Mingus Glas and Keadeen’s Second Star To The Right taking Select with Tipperary Ballyfinboy Liam Of Cnoc Best of Winners. The cluster also saw the final of the National Owner Handler Series and Keadeen’s Sir Emmet Mingus Glas cemented his top spot for Glens when he got the nod for BOB. The first Puppy Stakes to be run with the event occurred and the Glen Best Puppy was Finnabair DD Shut Up & Kiss Me. The Swedish Winners was a Best of Breed for Pearytail Bonnie B Goode with Rosears Master of The House being awarded Best Dog. Kelli and Griff were at their last Trial of the year at the Clever Dog Academy NADAC agility trial. Five quailifying runs in two days. What an end to a quite sensational year!! Just two but still out there! Just two Glen of Imaal Terrier results from the weekend. At the Swedish Winners it was a Best of Breed for Pearytail Bonnie B Good with Gleann Emotive Emmet Best Dog and over in America at the Seminole Dog Fanciers Association Gleann Cotton Cody was BOB and then Group 2! It might be winter but well done for still flying the breed flag! August may be holiday season…. ….but some Glen of Imaal Terrier people “holiday” at dog shows. Three back to back shows at Kuopio (Finland) saw 2 Best of Breeds for Glean Damn Daisy and one for Pearytail Bonnie B Good. Rosears Humpty Dumpty and Marfidal Pleasant Surprise taking the Best Opposites. Another 3 B2Bs in Canfield (Ohio) had Tipperary Cora Countess of Grantham doing the double BOBs with Daulton’s Princess C Hatteras taking number 3. A nice weekend for Abberann Torcan with a Group 2 & 3 at Marshall, Michigan. Sue Sutton, it doesn’t matter it was “only a little show” when Poachersmoon Sissy McGinty is Best Terrier, Best Irish Native Breed at Reserve Best In Show at Castlerea. 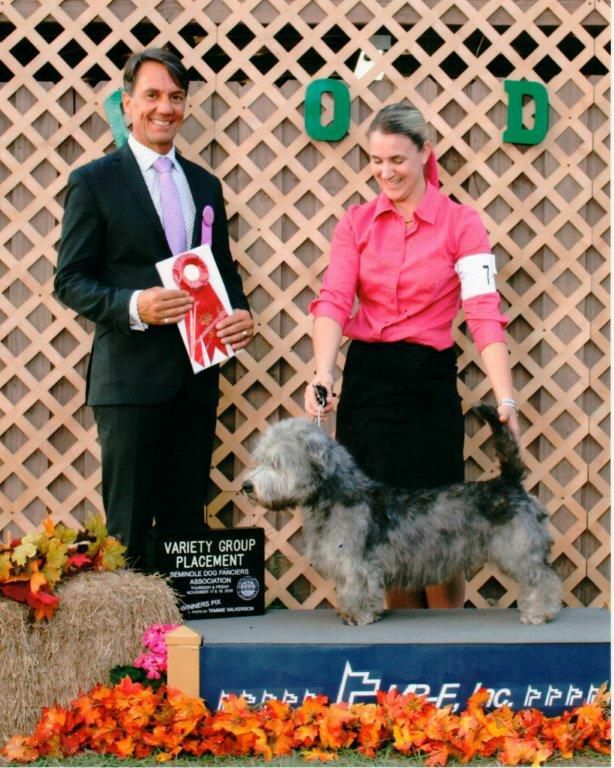 The Norwegian Terrier Club runs Junior Handling so applause to Siri & Tilla for winning. Okay, “Gatsby” got a Group 4 and “Picabo” Best Opposite but it would be nice to have names and places….hint, hint! Whether your full name or call name is all we’v got you’ve done us proud-congratulations all. Glen of Imaal Terriers, and their people, are out and about week after week introducing their dogs to people. The Finns put us all to shame with their enthusiasm. Gleann Damn Daisy was BOB at Kokkola International and BOS at Oulu were she had to bow the paw to Gleann Easter Eamonn. Back to back shows at Parnu (Estonia) saw Pearytail Bonnie B Good Best of Breed both days, so earning her Estonian & Baltic Champion titles, with Finnabair North American Nebulon Best Opposite. In Ireland the Ladies Kennel Show had Abberann Reach for the Stars Ryanne Best of Breed and in the UK Goosnargh & Longridge saw Donvaleset Rebus take BOB, group 2 and then Best Terrier Veteran!